Brisbane Arts Theatre is renowned for their exciting children's theatre programme. 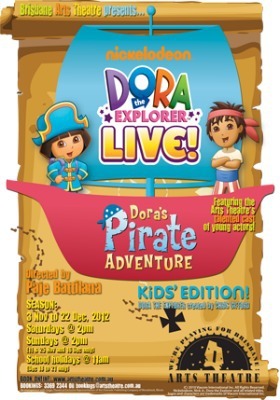 As the 2012 season draws to a close, I think that they've saved the best for last with Dora the Explorer Live – Dora's Pirate Adventure. Join Dora, Boots, Diego and all their friends as they set sail for Treasure Island for a pirate fiesta. They'll need your help to keep a lookout for that sneaky fox Swiper, as well as trying to get the pirate piggies to return their treasure chest. Get ready to baila (dance) and sing along as you follow Dora on her pirate adventure. There is so much that we loved about this show. The idea of a show that involved two children's favourites – Dora and pirates – immediately had my interest. The action on stage captivated my kids from start to finish, but they were equally amazed with the production elements including the lighting, props and live music. It was really interactive with the audience helping characters solve puzzles; perform songs, dances and special actions. 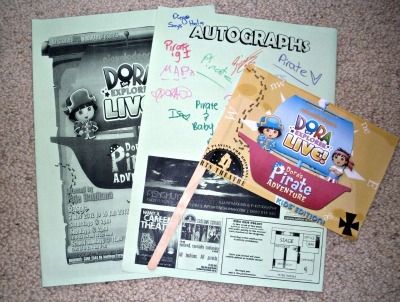 Every child in the audience even received a special Dora pirate flag to take home as well as to use during the performance. From a parent's perspective this show was fantastic value for money. Ticket prices are extremely reasonable (starting from $13), there is plenty of free street parking available right outside the theatre, and the smiles on the kids' faces were absolutely priceless. As an added bonus the cast do a meet-and-greet with the audience after the show. Not only do my kids now have memories to take away from this experience, but they also have their programs autographed by the cast and photos with their favourite characters. All of the cast members did a fabulous job of staying in character during the courtyard meet-and-greet and were so kind and patient with the kids (and the parents). The cast, which comprises a talented group of young Brisbane performers, delivered a wonderful performance obviously with the help of a very supportive crew. The production team, led by director Paje Battilana, have excelled at creating a very special performance for the Dora fans of Brisbane. Dora clearly seemed to be the crowd favourite as judged by the enormous number of squeals of delight when she appeared. E aged five – "I liked the parts when Swiper sang his songs the best. I helped Dora find him. I'm glad that he got to join in the pirate party". Weeks later she is still singing songs and doing dance moves from the show. C aged three – "I liked Dora's pirate shirt and hat. And I liked my ice block". During interval we purchased ice blocks for the kids from the bar to enjoy in the courtyard – lovely and shaded. For me, it was the adorable little pirate piggies and their captain who shone on stage. These cast members were amongst the youngest in the production and clearly enjoy performing. The Arts Theatre itself, located on Petrie Terrace, is a living piece of Brisbane heritage so it's worthwhile spending a bit of extra time before the show having a look around. As it is a smaller theatre every seat is 'a good seat' where the audience feels as though they are actually exploring alongside Dora and her friends. This is a wonderful opportunity to introduce children to the magic of the theatre. It is an affordable, easy to plan activity, where little ones are actually encouraged to participate. Dora the Explorer Live – Dora's Pirate Adventure is now playing with shows continuing throughout the summer school holidays until January 19. Bookings can be made online, via telephone on 07 33692344, or via email (bookings@artstheatre.com.au). Check the Brisbane Arts Theatre website for further details. If your little ones greet everyone with a friendly 'hola' instead of hello, or think that when you are talking about buying new 'boots' it means that you are bringing home a monkey (and believe me – this has happened) this is definitely a show not to miss. Be sure to book early to avoid disappointment. Look out for shows from the 2013 children's theatre programme coming soon. Why? Treat the kids with a live theatre show and beat school holiday boredom.